Click the image to jump to see the high-resolution screenshot. 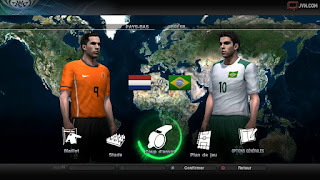 Hardly surprising news, but Brazil will be unlicensed this year in PES 2011. This has finally been confirmed, since the rumours originally surfaced. Like I've said, it's not the worst bit of news you'll hear this year. A quick option file job will make us all soon forget about the issue. * For those that are still not convinced, this screenshot was sent to me by a European friend who is playing the PC version.